So being that this is the month of "LOVE" AKA "Valentines Day", I did a science theme about the heart yesterday. I have two age groups at my house so I always try to make the learning available and appropriate as possible. My oldest was defiantly eager as she has a fascination with the human body and my youngest well he was just interested in the heart coloring pages I had printed out, LOL. There is so much to learn about the heart, I honestly had a lot of fun myself with this lesson idea. Your heart is located in your chest and is well protected by your rib cage. The study of the human heart and its various disorders is known as cardiology. 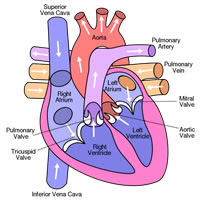 There are four valves in the human heart, they ensure that blood only goes one way, either in or out. Blood that leaves the heart is carried through arteries. The main artery leaving the left ventricle is the aorta while the main artery leaving the right ventricle is the pulmonary artery. Blood going towards the heart is carried through veins. Blood coming from the lungs to the left atrium is carried through the pulmonary veins while blood coming from the body to the right atrium is carried through the superior vena cava and inferior vena cava. You might have felt your own heart beating, this is known as the cardiac cycle. When your heart contracts it makes the chambers smaller and pushes blood into the blood vessels. After your heart relaxes again the chambers get bigger and are filled with blood coming back into the heart. You might have watched television shows or movies where a patient in a hospital is attached to an electrocardiogram (ECG). You might recognize it as the machine with a line moving across a screen that occasionally spikes (or remains flat when a patient is dying). This machine can measure the electricity going through a patient’s heart. A doctor can use the information to know when a patient is having heart rhythm problems or even a heart attack. Heart attacks cause scar tissue to form amongst normal heart tissue, this can lead to further heart problems or even heart failure.